One of the unique mechanical properties of our musculotendinous structure is the presence of a retinaculum (plural: retinacula) around many of the body’s joints. A retinaculum is a band or membrane that holds an organ or part in its place. It may also be defined as a thickening of the deep fascia in distal portions of the limbs that hold tendons in positions when muscles contract. The structure of the retinaculum has distinct advantages in certain areas. However, it may lead to further problems as well. Many muscles have a relatively straight line of pull. 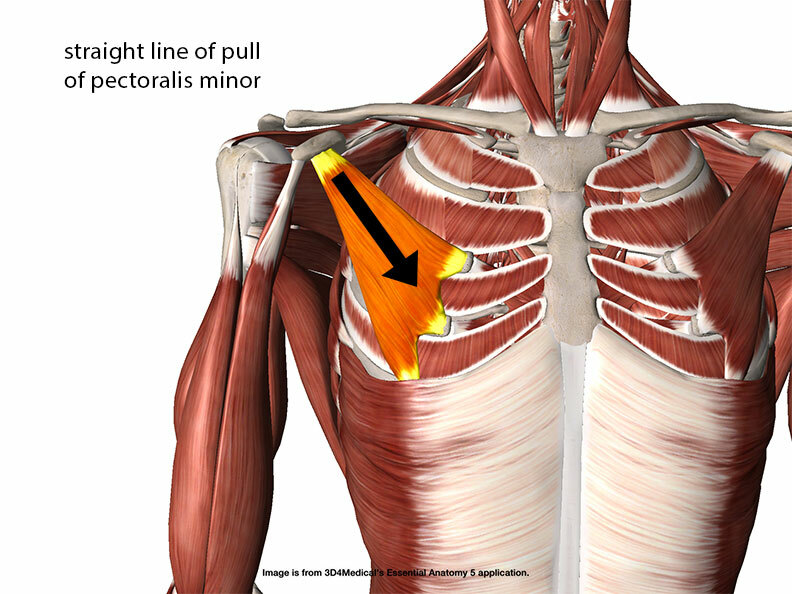 For example the pectoralis minor has a short and straight line of pull between its attachment points on the coracoid process and the ribs. The muscles of the distal extremities are much different. In the long tendons of the hands and feet the tendons do not have a straight line of pull. In some instances the tendon must take almost a right angle turn. The long extensors of the toes are a good example. They travel the length of the lower leg and then over the top of the foot to the toes. They take close to a 900 angle bend over the top of the foot near the ankle joint. In order for these tendons to be mechanically efficient they must be held close to the joint. If they weren’t there would be a tendency for the tendons to be pulled away from the joint when the muscle contracted. The body creates a natural pulley- like structure with the retinaculum that improves the mechanical efficiency of the tendons by holding them close to the joint. There is significant pressure between the tendons and the retinacula that bind them. To reduce friction and tendon damage, a synovial sheath covers the tendons that travel underneath a retinaculum. If the synovial sheath were not present the retinaculum would severely damage the tendon fibers during repetitive motion. This synovial sheath is not present in all tendons. For example, the pectoralis minor tendons mentioned earlier do not have synovial sheaths around them because they do not pass underneath a retinaculum. The most common location for tendons to have a synovial sheath is in the distal extremities where the tendons cross a joint underneath a retinaculum and make a significant bend or angle. Sometimes repetitive motion or compression during movement will cause an irritation between the tendon and its surrounding synovial sheath. Fibrous adhesions or a roughening of the surface between the tendon and its sheath may develop. This condition is known as tenosynovitis. 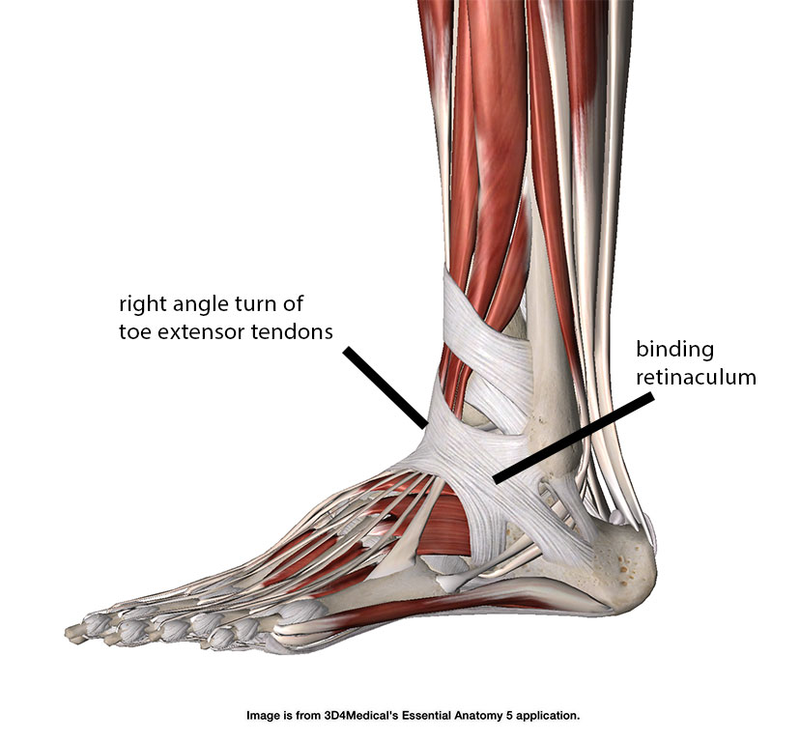 There is a common tenosynovitis condition that develops over the top of the foot where the long extensors of the toes pass under the extensor retinaculum called “lace bite” because tight shoelaces are often the primary cause. Tenosynovitis is treated very similar to tendinitis. Deep friction massage over the affected tendon may help mobilize the tendon and reduce adhesions between the tendon and its sheath. However, activity modifications and reduction of compression on the tendons will be crucial to fully resolve this problem.